Throughout history, marriage and parenthood have been linked milestones on the journey to adulthood. But for the young adults of the Millennial Generation1, these social institutions are becoming delinked and differently valued. Today’s 18- to 29-year-olds value parenthood far more than marriage, according to a new Pew Research Center analysis of attitudinal surveys. A 2010 Pew Research survey found that 52% of Millennials say being a good parent is “one of the most important things” in life. Just 30% say the same about having a successful marriage– meaning there is a 22 percentage point gap in the way Millennials value parenthood over marriage. When this same question was posed to 18- to 29-year-olds in 1997, the gap was just 7 percentage points. 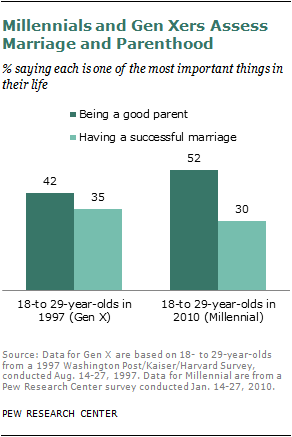 Back then, 42% of the members of what is known as Generation X said being a good parent was one of the most important things in life, while 35% said the same about having a successful marriage. Pew Research surveys also find that Millennials are less likely than adults ages 30 and older to say that a child needs a home with both a father and mother to grow up happily and that single parenthood and unmarried couple parenthood are bad for society. In many—but not all—respects, these attitudinal changes mirror behavioral changes. 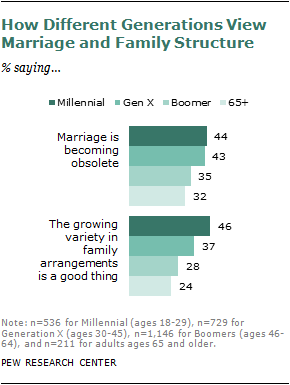 Young adults today are slower to marry than were their counterparts in older generations. Just 22% of Millennials are currently married. Back when Gen Xers were the same age that Millennials are now, some three-in-ten of them were married, as were more than four-in-ten Baby Boomers and more than half of the members of the Silent Generation (ages 65 and older). The delay in marriage among today’s young adults has been accompanied by a corresponding increase in the rate of out-of-wedlock births. Just over half (51%) of all births among Millennials in 2008 were to unwed mothers, compared with just under four-in-ten (39%) among Gen Xers in 1997, when they were the same age that Millennials are now. However, the overall incidence of parenthood among young adults has declined. In 2010, 36% of women ages 18 to 29 had ever had children; in 1998, that figure was 41%. Even though their generation has been slow to marry and have children, most Millennials look forward to doing both. Among 18- to 29-year-olds who are not currently married and have no children, 70% say they want to marry and 74% say they want to have children. Among those who have never married and have no children, 66% want to marry and 73% want to have children. 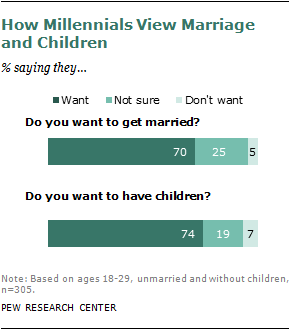 However, a significant minority of Millennials aren’t sure they want marriage (25%) or parenthood (19%). And a small minority say they don’t want to marry (5%) or have children (7%). 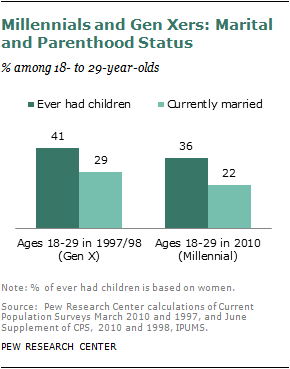 Millennials are less likely than older generations to link marriage with parenthood. About a third of Millennials (34%) think that more unmarried couples raising children is a bad thing for society, compared with 45% of those ages 30 and older. Likewise, about six-in-ten (63%) Millennials think that single motherhood is bad for society, compared with seven-in-ten (71%) adults ages 30 and older. More than four-in-ten (44%) of Millennials say that the institution of marriage is becoming obsolete, compared with 37% of those ages 30 and older. 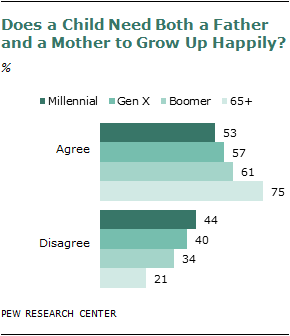 In addition, Millennials and Gen Xers are less likely than older generations to say that a child needs a home with both a father and a mother present to grow up happily. Only a slim majority of Millennials (53%) and Gen Xers (57%) say this, compared with three-quarters of adults who are 65 years or older. Data for this report mainly come from Pew Research Center surveys and the U.S. Census Bureau’s Current Population Surveys. Unless otherwise indicated, the report is based on a Pew Research Center nationwide telephone survey of 2,691 adults ages 18 and older, conducted Oct. 1-21, 2010. The number of cases for young adults ages 18-29 is 536. A total of 1,520 interviews were completed with respondents contacted by landline telephone and 1,171 with those contacted on their cellular phone. Margin of sampling error for results based on the total sample is plus or minus 2.6 percentage points and 5.9 percentage points for adults ages 18-29. Interviews were done in English and Spanish by Princeton Survey Research Associates International. Data on Millennials and Gen Xers’ marital status are from the Current Population Survey (CPS) of March 2010 and 1997. Fertility data are from June supplements of CPS 2010 and 1998 and final birth data for 2008 and 1997, National Vital Statistics Reports.